Eevin Hartsough, Ayun Halliday, Daniel Mirsky, and T Thompson in Wind-Up Variations. Photo by Anthony Dean. BOTTOM LINE: Wind-Up Variations is a futuristic, community-building story featuring four performers and four wind-up toys. 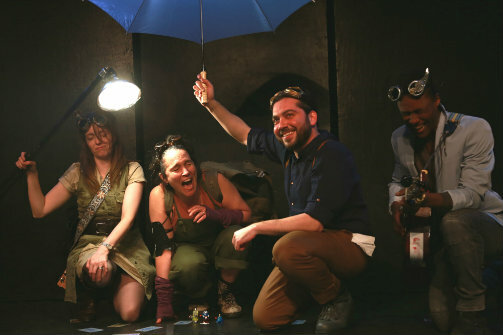 Wind-Up Variations is the newest show by the prolific New York Neo-Futurists, the much-lauded group most famous for Too Much Light Makes the Baby Go Blind. Like other work from this innovative company, Wind-Up Variations has a futuristic tone. Its space-age lighting (courtesy of David Haan), video and projections (from the mind of Lauren Parrish), and sound (engineered by Anthony Dean) all place us in the aftermath of an apocalypse. What happened is not for us to know, for we are not the survivors. We are, however, treated to the story of an unstoppable wind-up monkey. As this golden toy slowly but surely marches across the stage of the Kraine Theater, the ensemble regales us with some deceptively simple stories that add up to a satisfying, powerful whole. Created, written, and directed by Rob Neill, Wind-Up Variations is performed by veteran and current ensemble members Ayun Halliday, Eevin Hartsough, Daniel Mirsky and T Thompson, with the help of Chris DeSantis and Coleman Sisk. The actors interview each other and tell us of their isolation. In other words, they ask and answer a lot of questions, some of which are also directed to the audience. One memorable question, "where do you feel safe?," yields answers like "at home," "in museums," and "onstage." Eevin Hartsough sings some Russian songs and plays the ukelele. Some heavy primate symbolism ensues. Ayun Halliday who is the co-founder of Theater of the Apes, makes a few references to Hanuman, the legendary monkey warrior king. Is this what the play is about? Have no fear, the monkey is not alone. A wind-up blue dinosaur and a wind-up robot join in the march. And, in one of the show's many beautiful moments, a wind-up unicorn appears. The cast tell us that the toys sang "Beep Boop Beep Crunch Roar." T mixes some sound and plays some electric guitar. Gradually, the cast draws the audience out and gets them feeling good, even the shyer members; indeed, such work is part of their mission. Individual memories and vulnerability are encouraged, as long as we are all in it together. By the end of the show, videos from the cast have explained their roles in the creative process, balloons have been bounced around the theater, and the audience has found many ways to bond with the wind-up toys. It all feels Brechtian and Communist and self-affirming. In other words, very Neo. Wind-Up Variations is written and directed by Rob Neill. Video and Projection Design by Lauren Parrish. Lighting Design by David Haan. Sound Design by Anthony Dean. Costume Design by Sarah Snider. Props Consultant is Connor Kalista. Stage Manager is Hadley Todoran. The cast is Ayun Halliday, Eevin Hartsough, Daniel Mirsky, and T Thompson.